Christmas gift for my sister-in-law who has a second home in Providence, RI (yellow house). Her favorite time of the year is Fall. 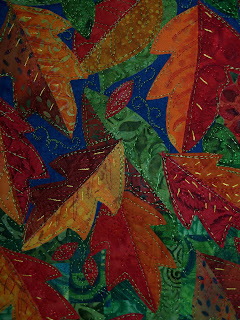 Two-toned fused leaves onto blue wool felt. 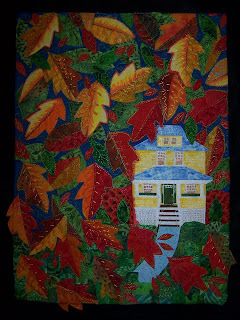 The leaves are hand painted, machine quilted and hand embroidered. Looks wonderful Jamie and I love the close up photo. That blue wool is delicious and so is your quilting. This is beautiful and so inspirational. The hand-stitching really adds so much to it. I love it!